There are those amongst us who, through their words and actions, radiate strength, courage, compassion, and generosity, causing a positive ripple to spread across the communities they touch, increasing the good in the world, and casting light against the darkness. George Eugene Ball was such a man. When I was a teenager, my parents would visit our grandparents, and on the way would drop my brother and me off at the University of Guelph library, where we would happily spend a Saturday or Sunday pouring through the shelves of beetle and spider books, photocopying as many of them as we could. It was in this library that I discovered Ross Arnett’s Beetles of the United States, and, inspired, purchased a copy of that tome. 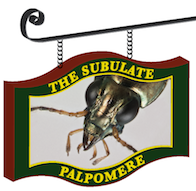 One chapter in particular captured my attention, about Carabidae, written by George E. Ball of the University of Alberta. As a 16-year-old, on 13 December 1974, I decided to reach out to Dr. Ball, in case he might be able to answer my queries about some of the ground beetles I was finding in southern Ontario. 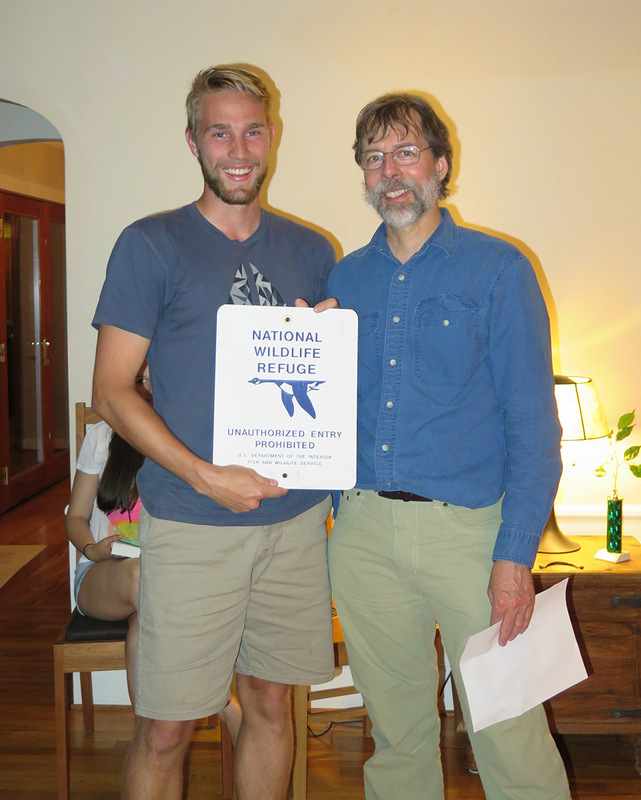 I wrote him a four-page letter, but did not expect a response – a famous professor would surely have more important things to do than write a teenager far across the country. 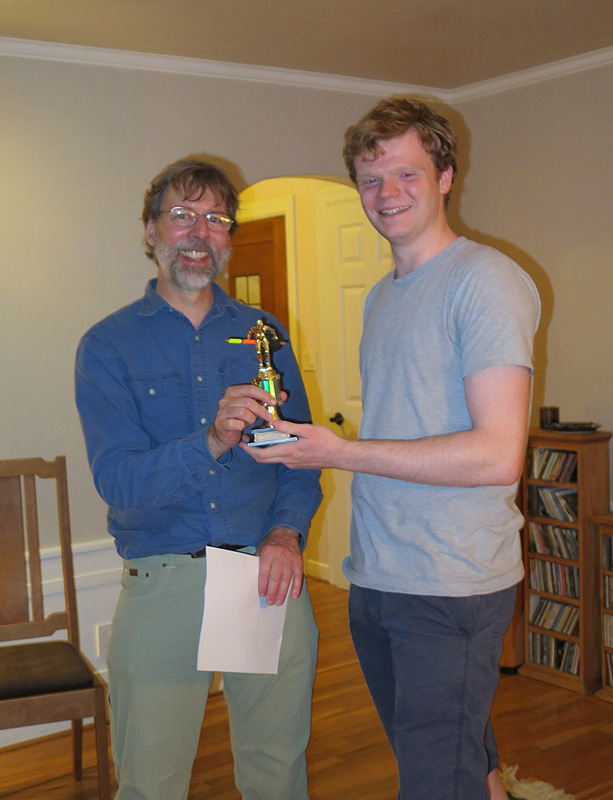 To my great surprise and delight, a few weeks later I received an eight-page letter in response, answering my questions in detail, and providing me with the names and addresses of many other carabid systematists to whom I could write. 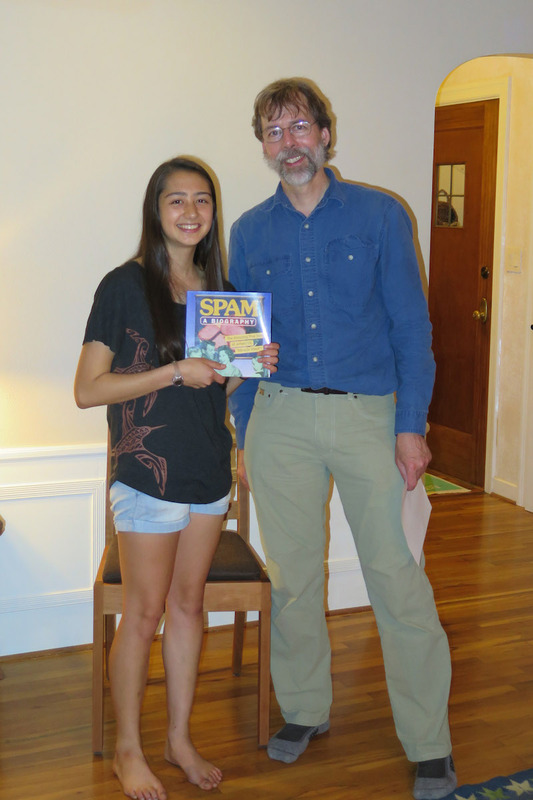 Decades later, when I wrote a letter telling George how profoundly his letter affected me, and how much it inspired me, and thanking him for it, he replied that the best way to thank him would be to respond similarly when a 16-year-old wrote me asking me questions about her or his favorite beetles. This typified George. He was a man of principle, duty-bound to serve the causes he believed in, including the people who were part of his community. He would have viewed helping me as a necessity, as he was committed to educating youth and encouraging those who might engage in the honourable cause of discovering and documenting our planet’s biodiversity. George sought to deflect attention away from himself. He did not want to be viewed as a grand master, separate and above the rest of us. In later years he reluctantly allowed us to celebrate his achievements, not because he wanted to bask in the glory, but rather because it allowed him to see old friends and hear about their discoveries. George was virtually egoless when it came to science. I remember once sitting with some fellow graduate students as George was explaining some entomological knowledge or systematic principles (I don’t remember which), and at one point he just stopped, looked thoughtful for few seconds, and said, “Wait, why did I just say that? That isn’t true at all”, and he then proceeded to correct himself. This was a profound message to those of us concerned about social standing: it told us that science required us to focus on honesty and the pursuit of knowledge, even if that meant proving ourselves wrong in public. We learned that science was not about us; our pursuit was bigger than any of us. One of George’s most important traits was his positivity toward others. He was almost always generous regarding others, and emphasized their better traits. He would not say anything negative about anyone in frustration or in spite, an inspiring demonstration for those of us not always so kind. Even in situations where it would be better to be honest about the negative traits about someone, he struggled to express them. To be at fault in this direction is vastly more preferable than the alternative. One might think a man such as this would set such a daunting example that he would not inspire others, as he would be viewed as so distinct from the rest of us that we could not possibly follow his path. But George was humble, and that gave us a sense that we, too, could live by those principles. He was also not perfect, and did not hide his imperfections, and through those we could see his struggle, and what he had achieved by force of will; this led us to believe that we too could achieve our goals with honesty and hard work. You will be missed, George, but the ripple of goodness and light that you created will continue to spread and amplify. Yesterday, after about three years in gestation, we released Zephyr 2.0. 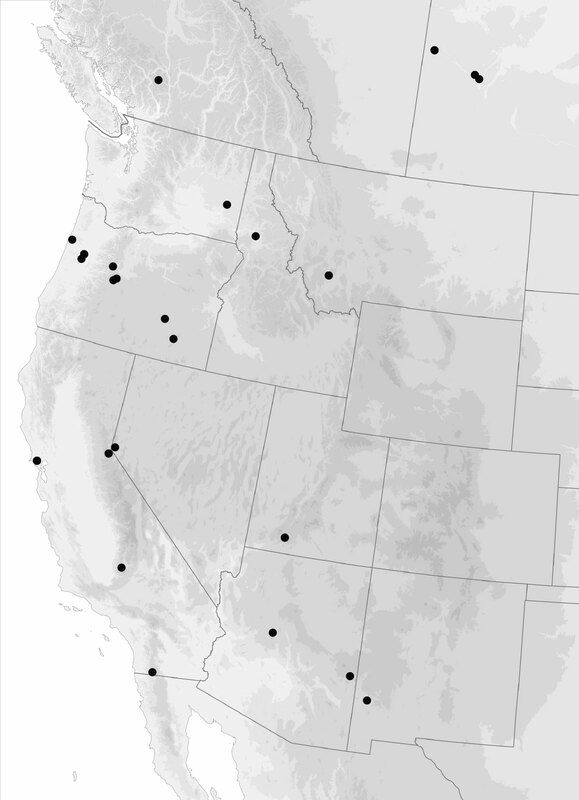 Zephyr is a Mesquite package that manages interactions with phylogeny inference packages including RAxML, GARLI, PAUP, and TNT. The most notable additions to Zephyr 2 include implementation of the SOWH test, CIPRes support, much better interapplication communication, and more extensive support for PAUP. Many bugs were also fixed, and other improvements made. then the SOWH feature in Mesquite will automatically find the observed value of the test statistic using whatever tree inference program you choose among those Zephyr supports, and simulate data many times on the model tree, calculating the test statistic for each simulated matrix. It will show you the p-value as the analyses goes along, and gives a report once you have decided you have done enough replicates. More details are in Zephyr’s SOWH test documentation. CIPRes (CyberInfrastructure for Phylogenetic Research, http://phylo.org) provides a gateway for doing phylogenetic inference on a fast cluster of computers. Zephyr 2 allows one to run analyses on CIPRes from within a Mesquite session, and will harvest the results once done and move the trees into the Mesquite file. Zephyr 2 has many improvements under the hood, including much better communication mechanisms between Mesquite and the external program. Among the improvements are the option to have Mesquite directly start the external program (as opposed to asking the operating system’s shell to do that), which gives Mesquite more control over the process. Zephyr 2 now provides a means to do likelihood, distance, and SVD quartets analyses using PAUP from within Mesquite. 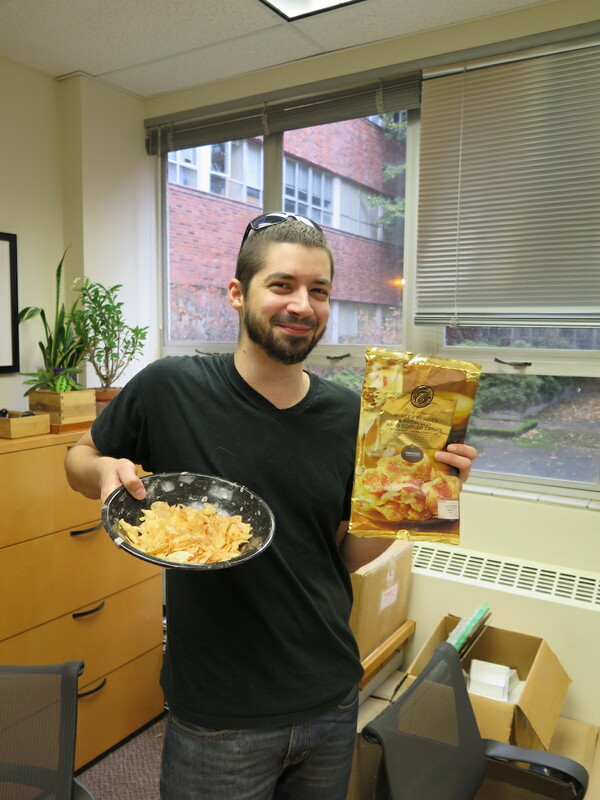 Today we reached a milestone: our 100th flavor in our approximately weekly Guess the Potato Chip Flavor event in my lab. Today we decided to celebrate the event not only with our 100th flavor, but also with five other flavors to round out the meal. Those five other flavors were some current Lay’s flavors: West Coast Truffle Fries, Southern Biscuits and Gravy, Greektown Gyro, New York Reuben, and Pico de Gallo. Over the last couple of years we have had quite the variety: Happiness Butter (from Japan, by a South Korean company), Butter Chicken (Lay’s, from Canada), Slow-cooked Ribs (Old Dutch, from Canada), and many others. Some were excellent, some.. not so. The two that stayed in the bowl the longest, by far, were Sea Salt Pomegranate and Cappuccino. We try to stick to potato chips, but we do occasionally branch out into other types (such as corn chips) if there are compelling flavors or if we have no novel potato chip flavors. 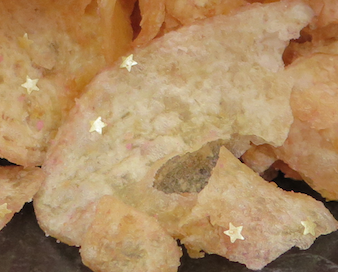 They have edible gold stars on them! The flavor: Winter Berries and Prosecco with Edible Gold Stars and a touch of Fizz, by Marks and Spencer. Berries and sparkling wine with gold stars. Wow. I can’t imagine how we can top that. Here’s the full list of what we have tried. 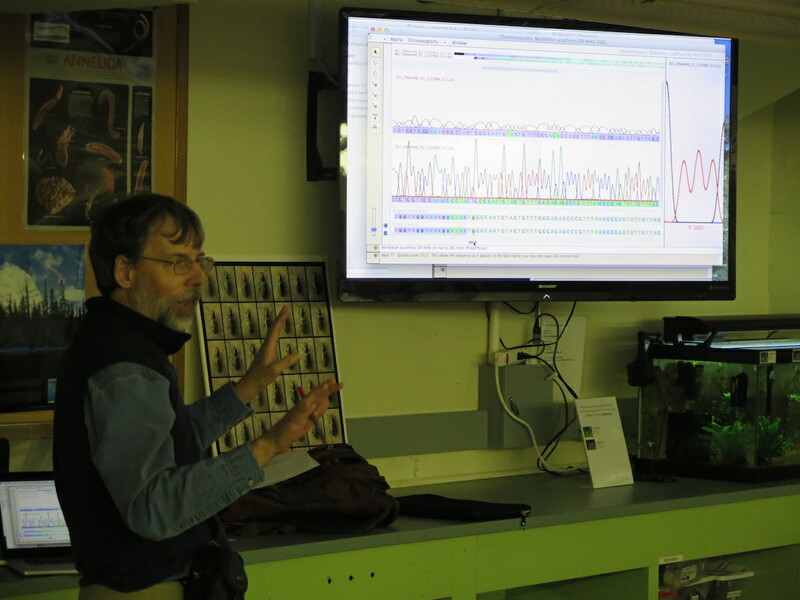 When last I blogged, the Discovering Insect Species course was in full swing; we were excitedly waiting for the DNA sequence results from our first big field trip, which was to Klamath Marsh National Wildlife Refuge. I’m sorry I didn’t post regular blogs during the remainder of the course, but so many exciting things happened, so quickly, that I never caught my breath enough to write down what was going on. 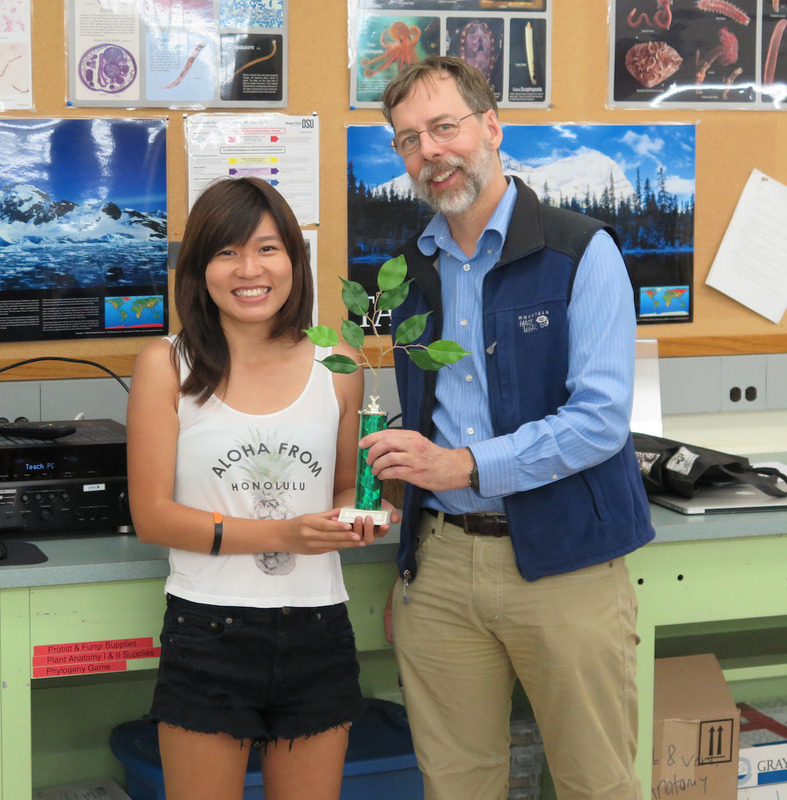 This overview post will be followed by some blog posts about particular aspects of the course, including the discoveries made in the class, some thoughts on teaching gene tree / species delimitation modeling to students, and the class projects, and the Awards Ceremony. 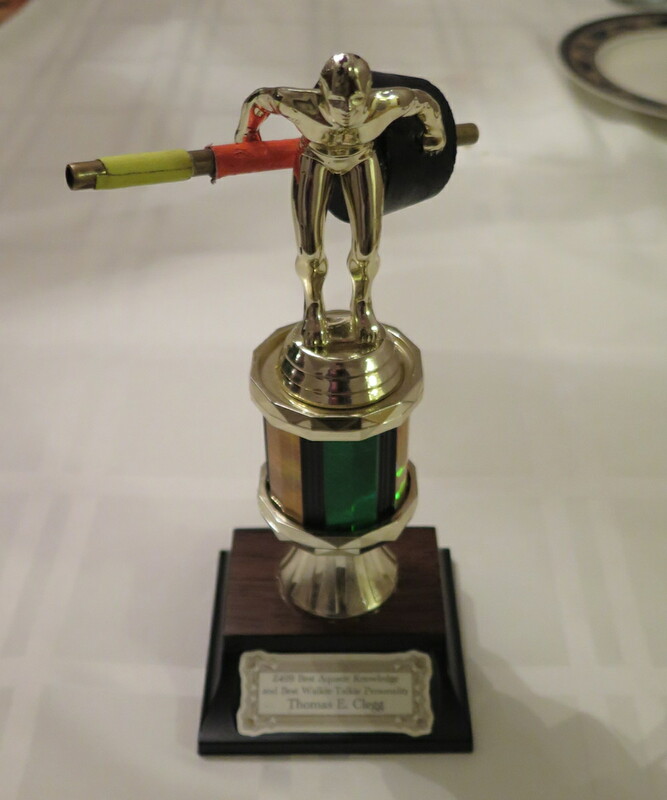 Cutting to the chase, the course was awesome, and tremendously successful. It was the most rewarding experience of my career as a teacher, and I think the students got a huge amount out of it too. We did indeed discover two new species during the course (as promised in the name of the course! ), two species I had never seen before, which very much added to the excitement – more on that later. The course was quite costly, both financially (I spent about $8000 on it) and in terms of my time (and John’s, who served as a TA), but I hope this single experience has a significant impact on the students who participated. Below is a general overview of the events in the course. There are many details missing here, and I will cover a few of those in later blogs. Tuesday, 31 March: Introduction. We had exercises with tamarins; students as a group looked at pictures of 26 specimens of tamarins, and had to hypothesize species boundaries. We then did a similar exercise with a subgenus of Bembidion (subgenus Liocosmius, with pictures of the beetles and gene trees). 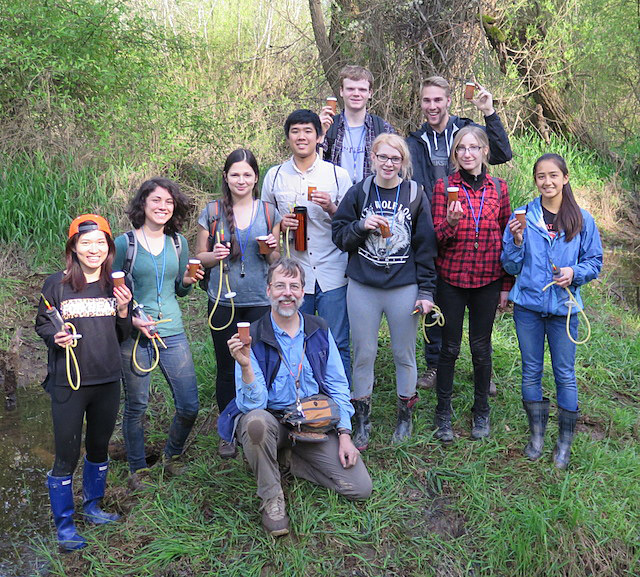 Thursday, 2 April: Field trip to the Willamette River in Corvallis where we found four species of Trepanedoris: B. elizabethae, B. fortestriatum, B. siticum, and B. acutifrons. 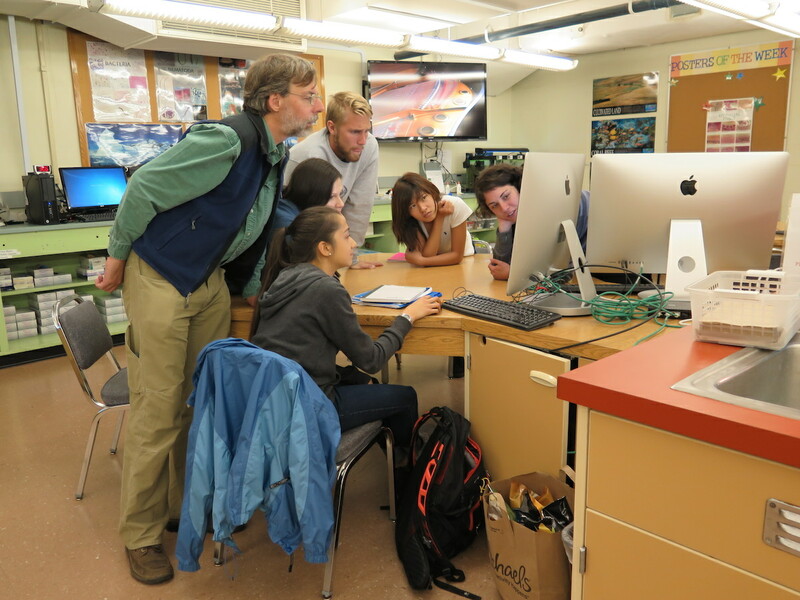 Tuesday, 7 April: The students learned how to point-mount and label specimens. 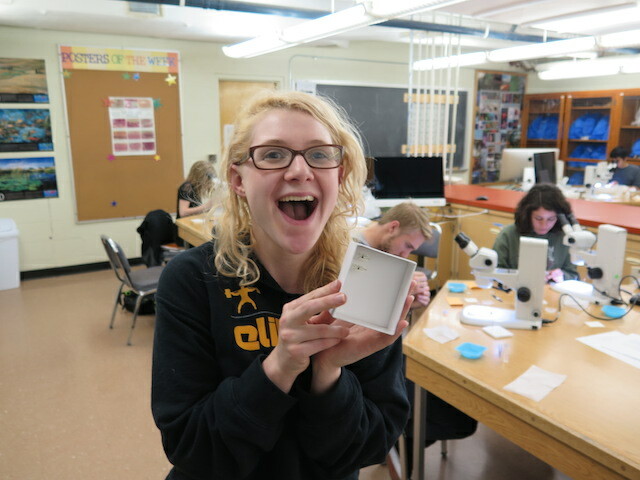 Students mounted specimens from the previous class’s field trip, and looked at Trepanedoris under the scope, to become familiar with their structures. 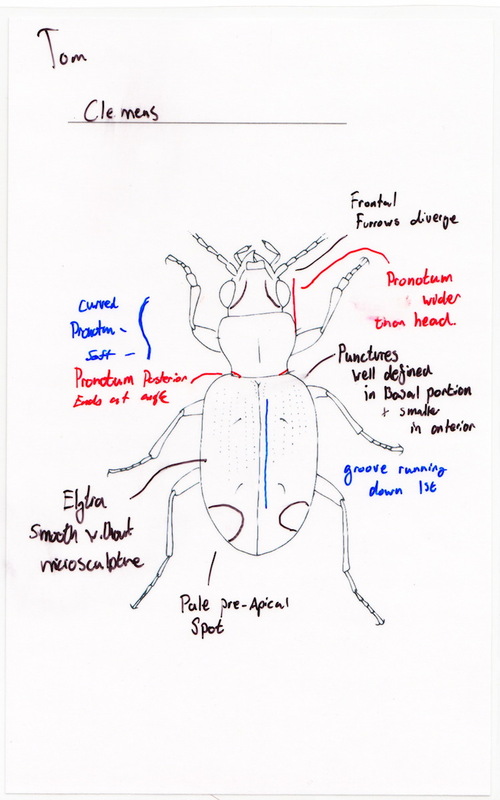 Thursday, 9 April: We used Lindroth’s key to try to identify specimens; this required learning the structures of beetles, and basic terms. 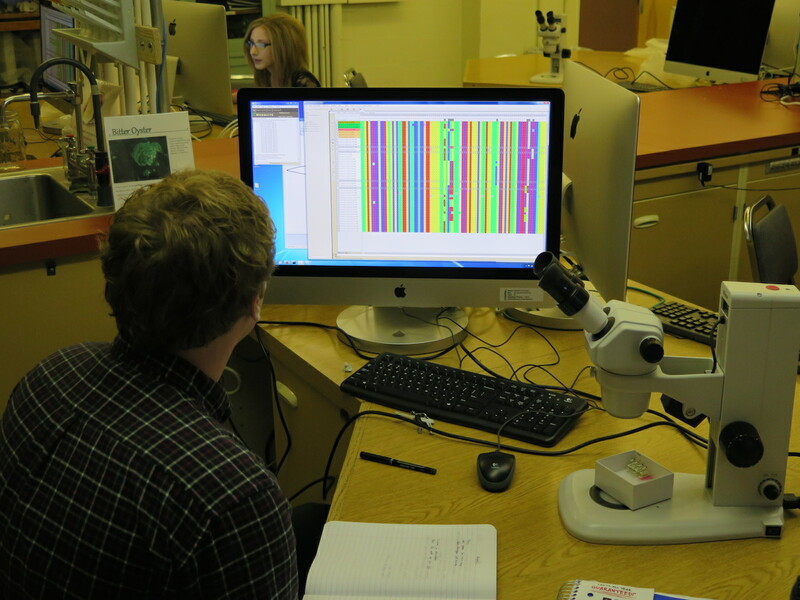 The student then sorted pictures of the 43 already-extracted specimens (pictures included habitus, head, genitalia), and in so doing predicted species boundaries. 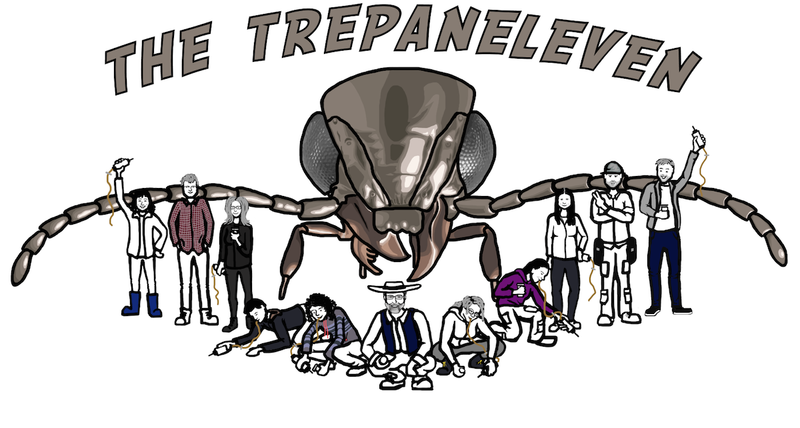 After predictions were made, there was a mini-lecture about the current status of studies of Trepanedoris, including taxonomic history of group. 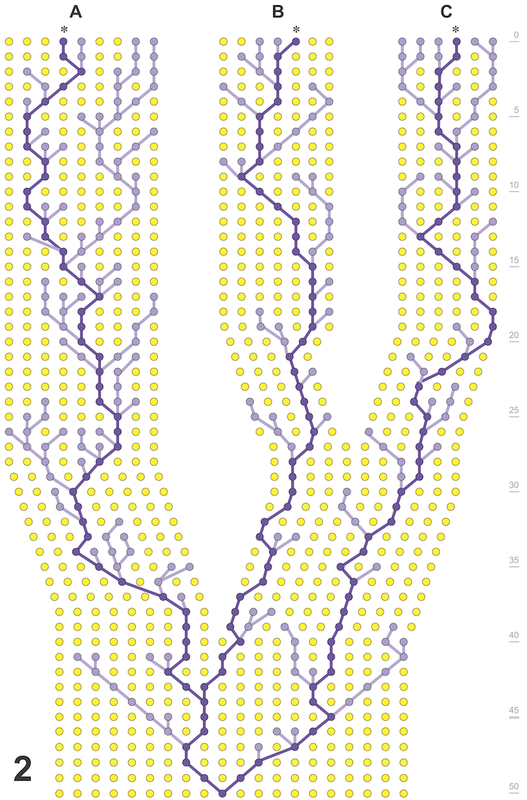 I showed gene trees, and we compared them to the student’s predictions. 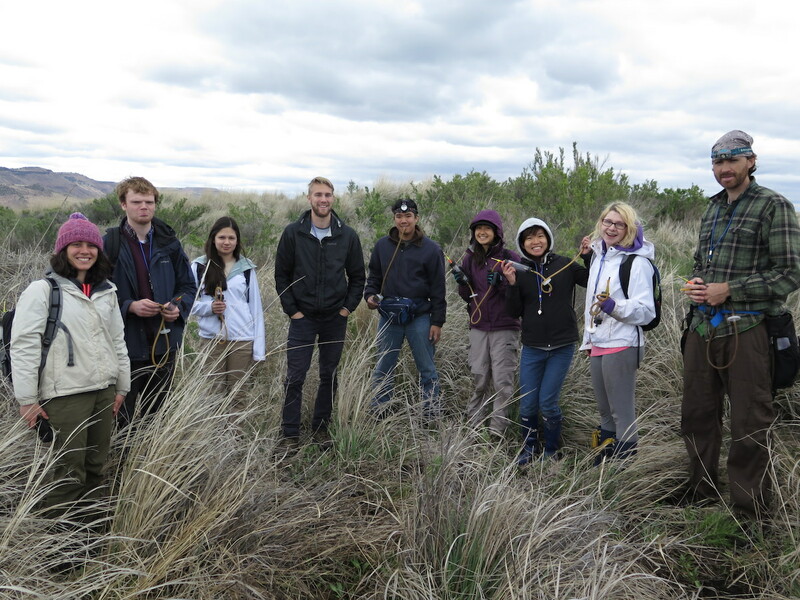 Friday-Sunday: Weekend field trip to Klamath Marsh NWR. 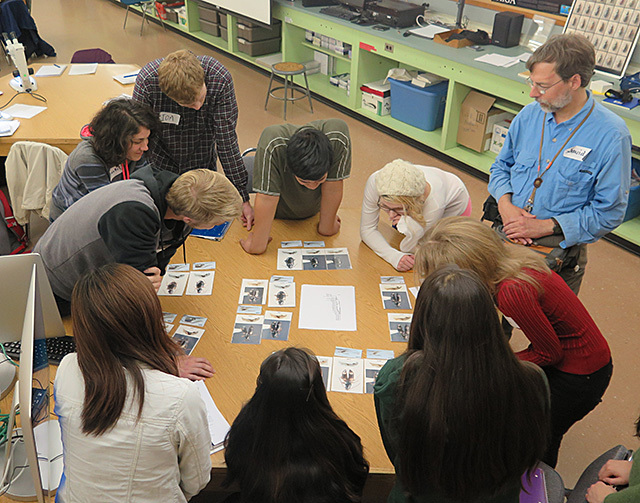 Tuesday, 14 April: Students extracted DNA of specimens from the Corvallis field trip and those from Klamath Marsh NWR. Each student extracted DNA from four specimens, chosen by David. As a whole, the set of specimens studied represent the diversity of forms we collected. Thursday, 16 April: Students PCRed 28S and COI for the extracted specimens. 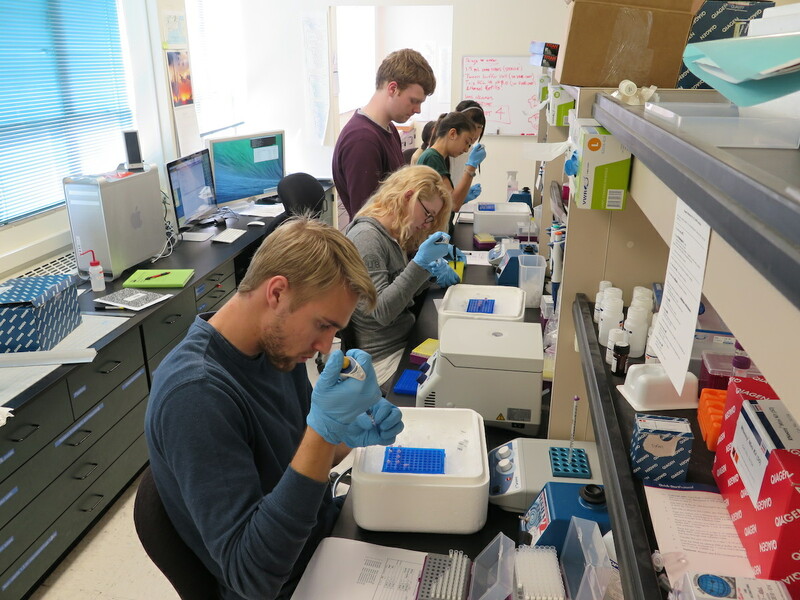 After the reactions are on the thermal cyclers, each student point mounts their four voucher specimens, and labels them. 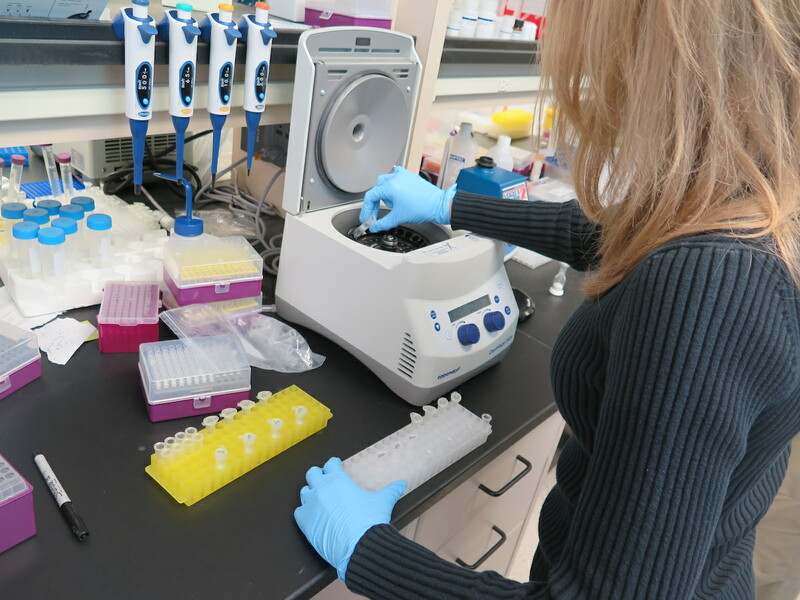 Tuesday, 21 April: Run PCR gels, prepare products for DNA sequencing. 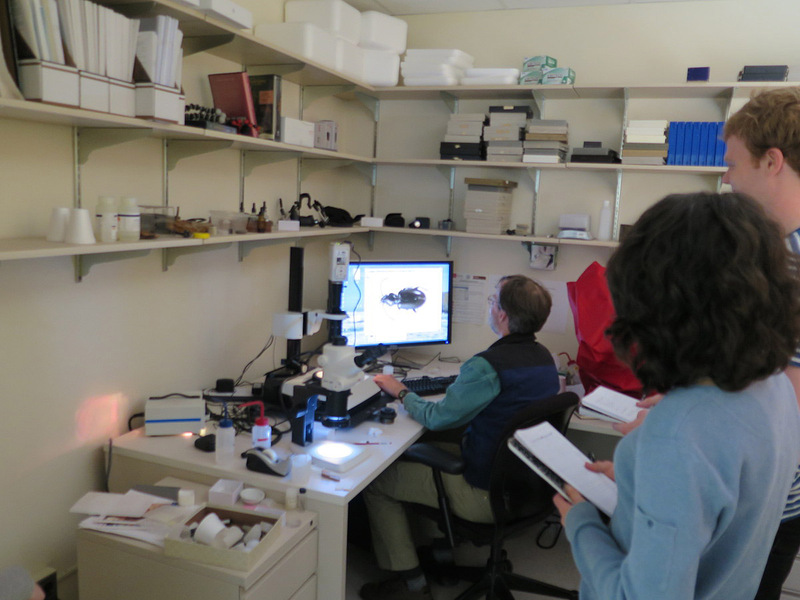 While gels are running, we learn how to take pictures of beetles on David’s imaging system. Thursday, 23 April: We examined in Google Earth the distribution of previously sequenced Trepanedoris, and the specimens they did genetic work on. 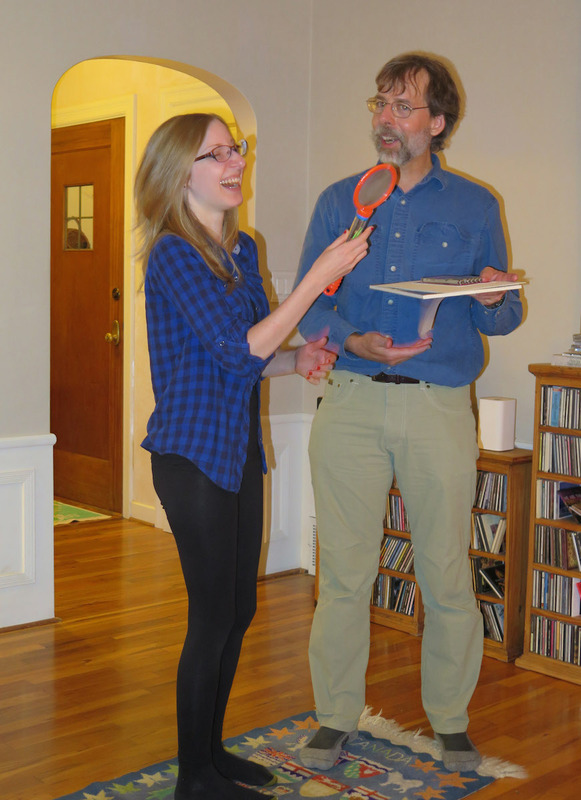 Students look at their specimens, and try to identify them. 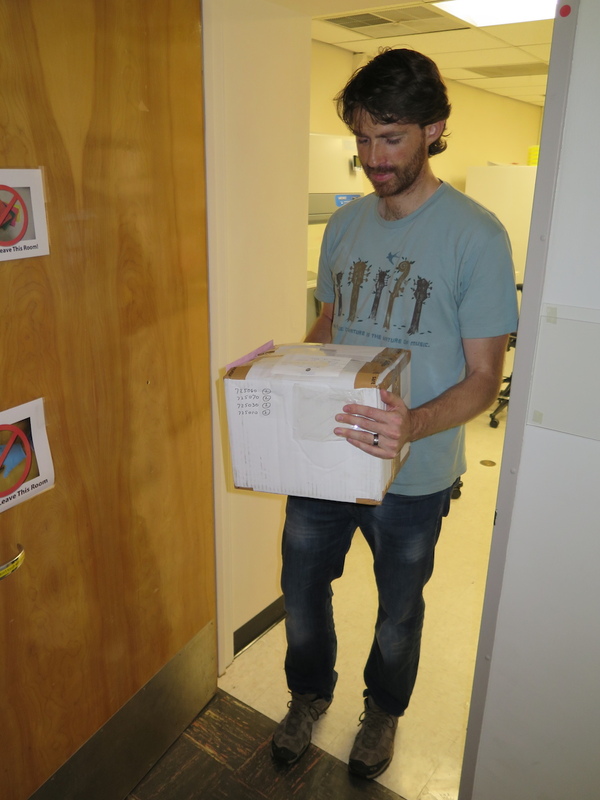 They hand in predictions as to where the sequences of their specimens will fall in the gene trees. Mini-lecture and discussion: what is the Tree of Life? 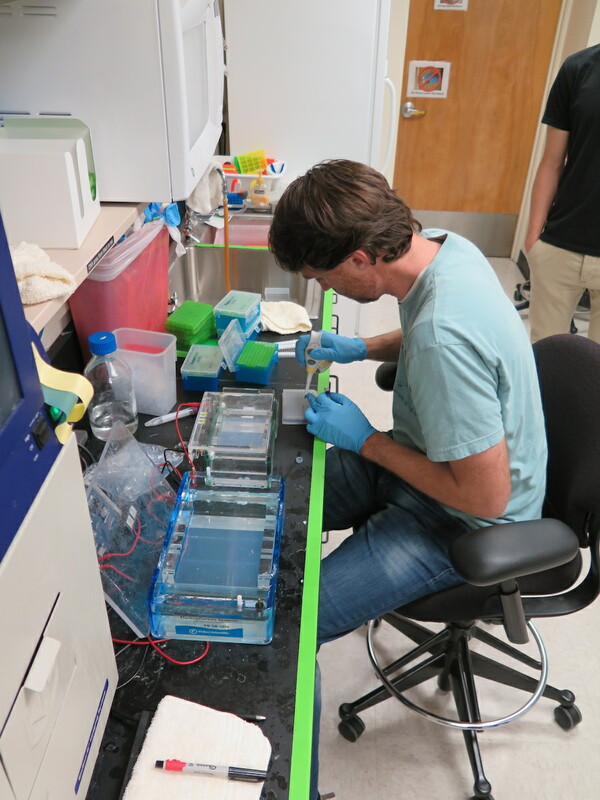 Tuesday, 28 April: I showed a slide show of preparing the sequencing plates, and sending them off to be sequenced. 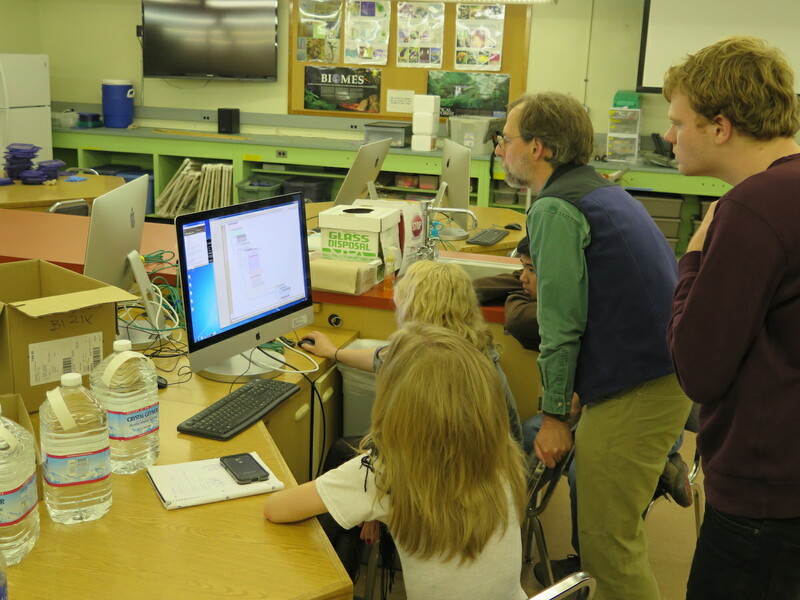 Students then took previous sequence data for four genes, and used Mesquite/Zephyr/RAxML to infer gene trees. 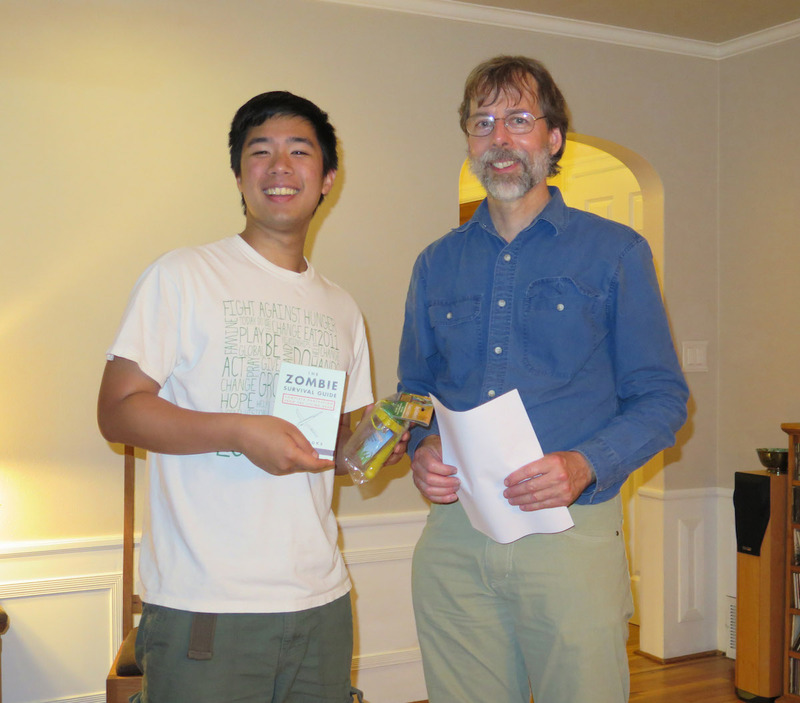 There was a mini-lecture and exercises about gene trees and species trees and coalescence. 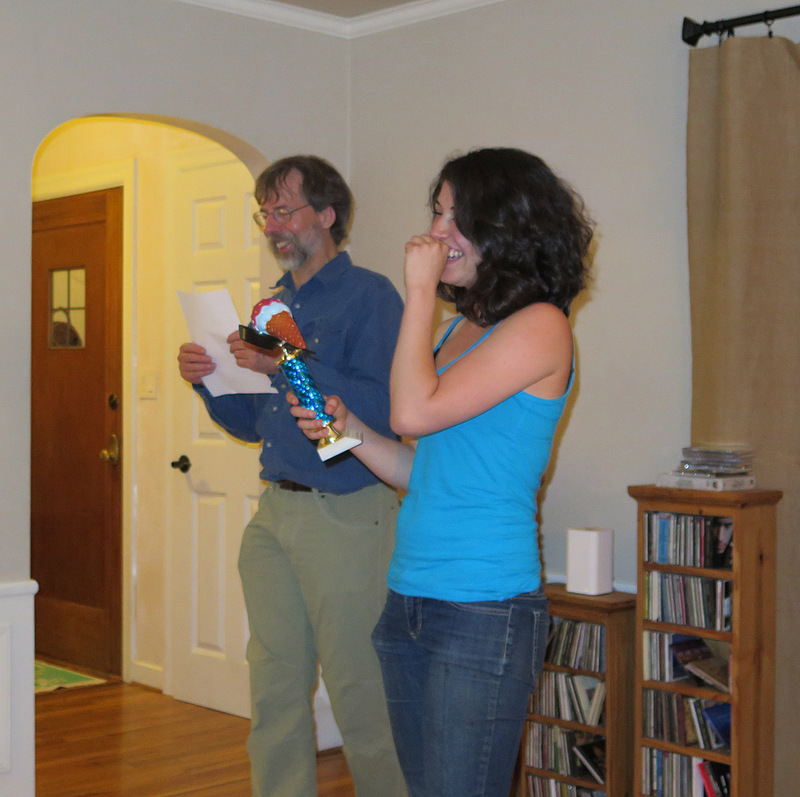 There were dice-based exercises, and Mesquite-based coalescent simulations. I’ll write a separate blog about these exercises. Thursday, 30 April: In this class students were given blank, laminated cards with an outline of a “generic” Trepanedoris. The students had access to the literature, the knowledge they had gained to date, all the vouchers, and microscopes. Their goal was to make cards showing the diagnostic features of a species, by marking up the card with a sharpie. Each student was responsible for making a card for each of two species. Each species had cards made by two different students, who then had to get together and come up with a single card that synthesized their views about the diagnostic features. It was made more difficult to do as more than half of the species are not described in Lindroth’s (1963) work, so the students had to figure much of it out on their own (with my help, of course). After doing this, students looked at the specimens they sequenced, and made revised predictions about what species they were, and where they would fall in the gene trees. Tuesday, 5 May: The DNA sequence data is available!!! We download it in class, and process it for the first time as a group. 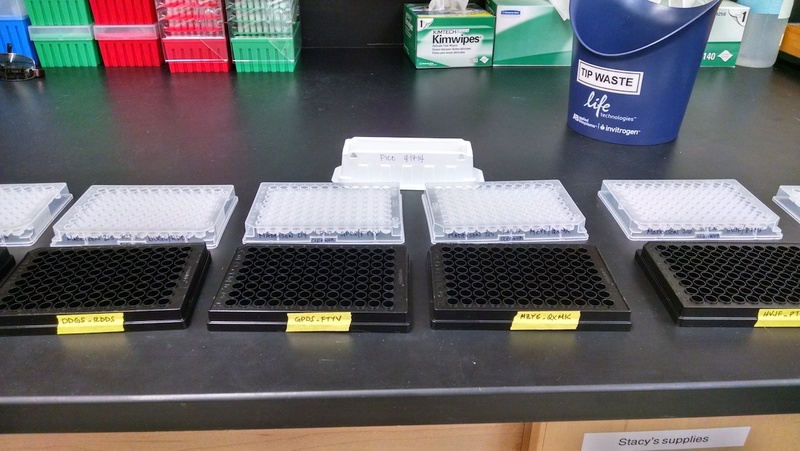 There are four sequencing plates, each containing 96 sequences. Once the data was downloaded, I made initial base calls and contigs for all four plates in about 5 minutes using Mesquite/Chromaseq/Phred/Phrap. I did this on my laptop hooked up to a projector, so that the class could watch as it happened. 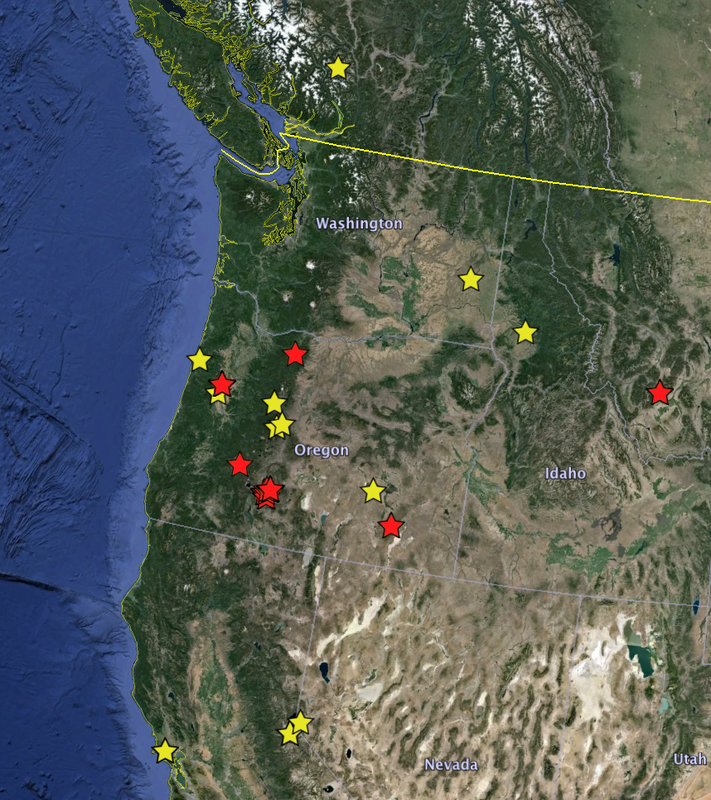 I incorporated the 28S sequences from the beetles the students caught in Corvallis and at Klamath Marsh into the existing matrix of 28S sequences, and passed the matrix around to the class. 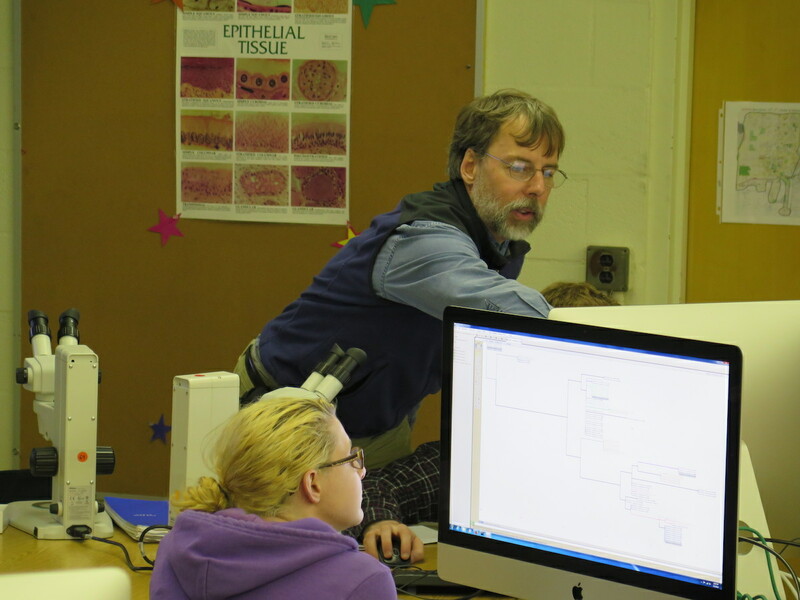 The class then did a RAxML analysis to get the gene trees, and they each had to see where their four specimens ended up, and whether or not the relationships were as they predicted. 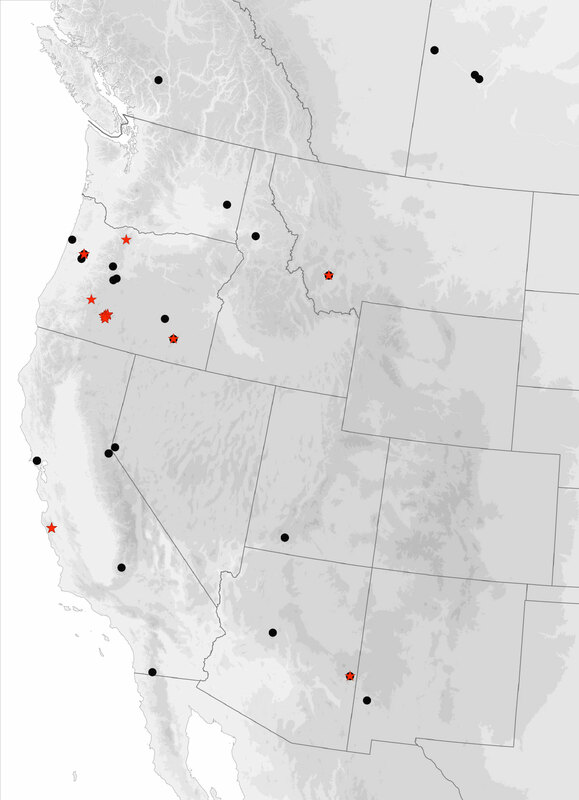 And then I incorporated all of the remaining sequences, including from a large number of specimens from all around western North America, and did analyses for all four genes. This was all done in class on the big screen, and it was very exciting for all of us to see the results live. 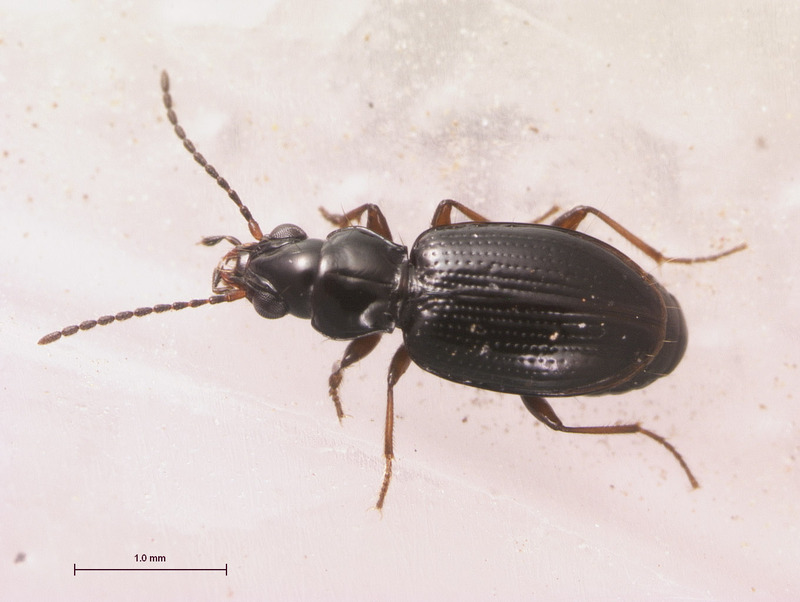 The most exciting discovery, by far, was that the two specimens we collected at Klamath Marsh that I initially thought (while in the field) were Bembidion “Lost Lake” were not that species at all, but instead another species I had never seen before! 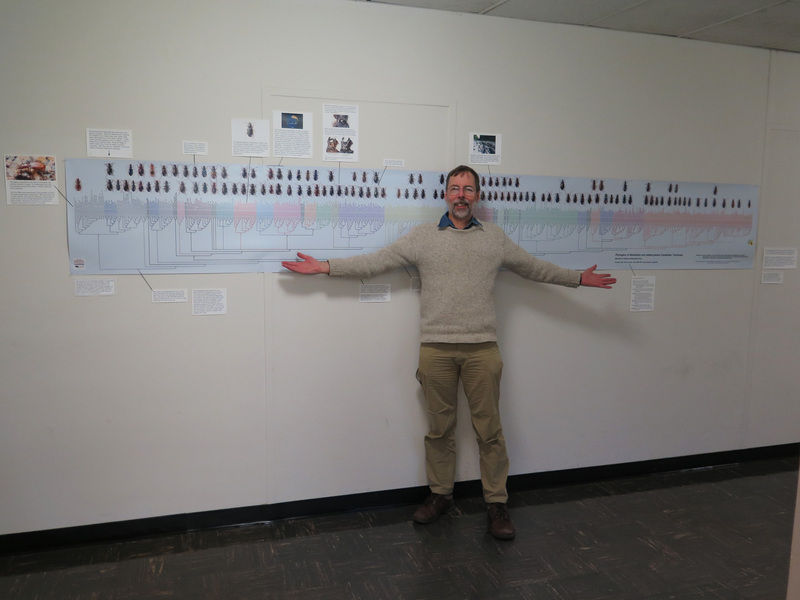 Thursday, 7 May: I printed out large versions of the gene trees we inferred on Tuesday, and posted them on the walls of the class. After all of the excitement of the previous class, we spent this class sorting Trepanedoris, and mounting other specimens from Klamath Marsh. Tuesday, 12 May: Lecture and exercises about gene trees and species trees. Mini-lecture on how nomenclature works. 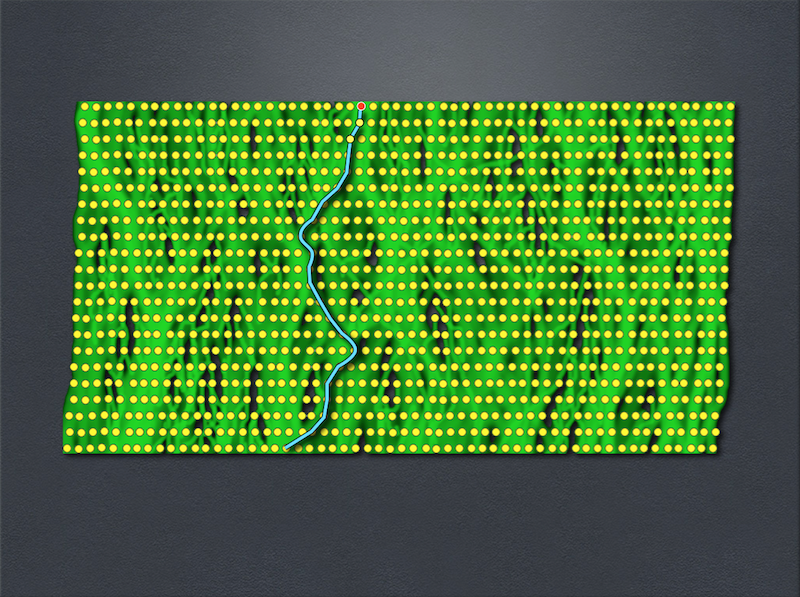 What is a gene tree? A particular model of a species tree has implications as to what we expect the gene trees to look like. Why? How can we use this information to infer the species tree? How does inferring the species tree allow us to determine what species exist now in nature? 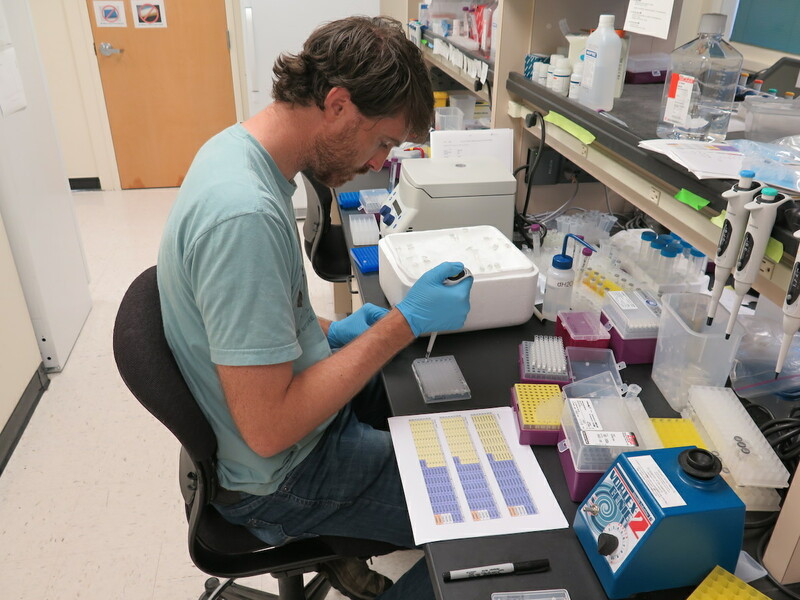 Tuesday, 19 May: DNA extraction from Malheur NWR trip, of specimens chosen by David. 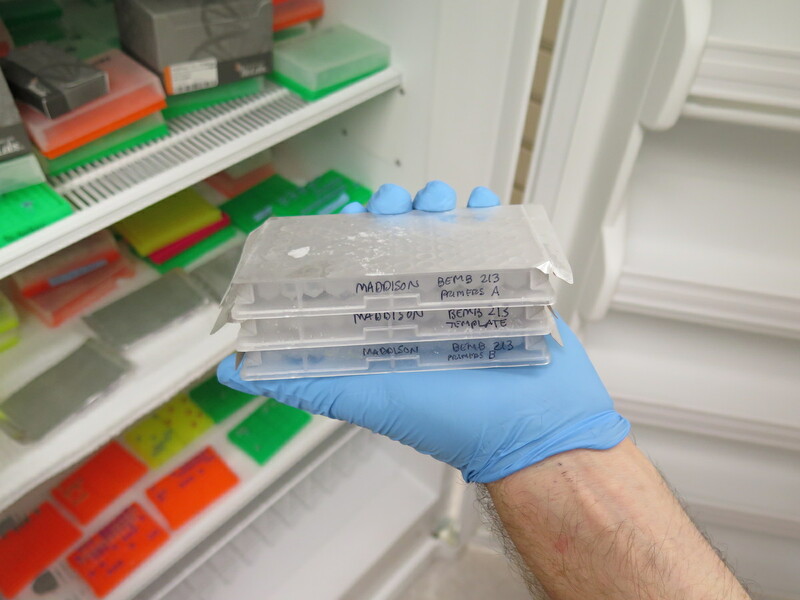 Thursday 21 May: PCR of Malheur specimens, plus extensive PCR of the gene MSP for previous specimens. Tuesday, 26 May: Each student had to do a “Taxonomy Now” presentation, which consisted of their choosing 0ne paper from the literature that described a new species, and telling us about the paper. They had to tell us how many species were described, what evidence was used to claim that the new species were distinct from other species, whether that evidence was convincing, whether the authors had looked at the type specimens of the already described species, etc. Students chose everything from sharks to fungi. The students also had free time to work on their projects during the class. 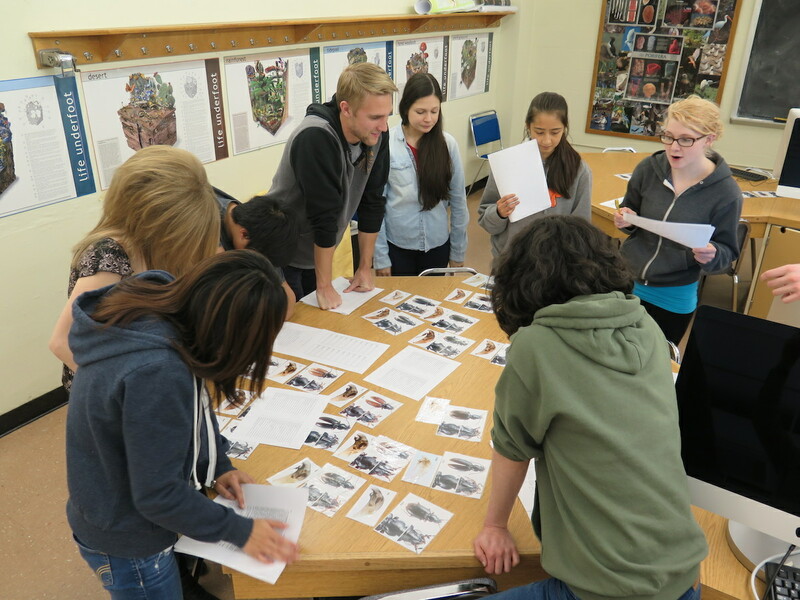 Thursday, 28 May: We mounted specimens from the field trips, looked at pictures of type specimens, and did more sorting. 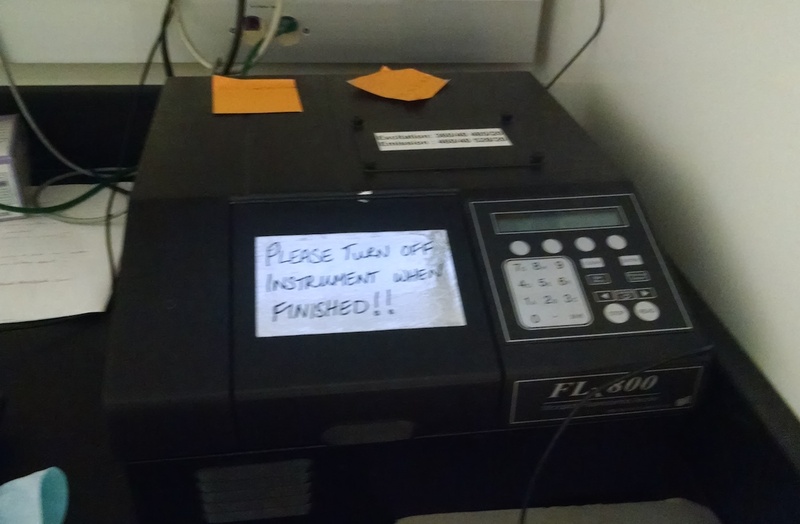 Tuesday, 2 June: We got back the last batch of sequences (about 380 more), and processed them in class. 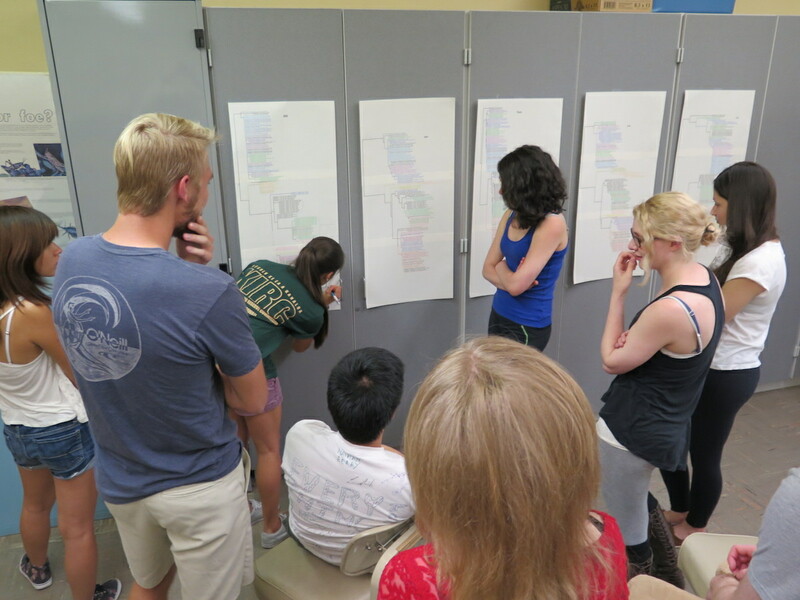 This time the students had to do much of the processing themselves, including inferring the gene trees. They talked in groups about the results, and we talked as a whole. There was much excitement in this class as well, as there were many interesting discoveries made. 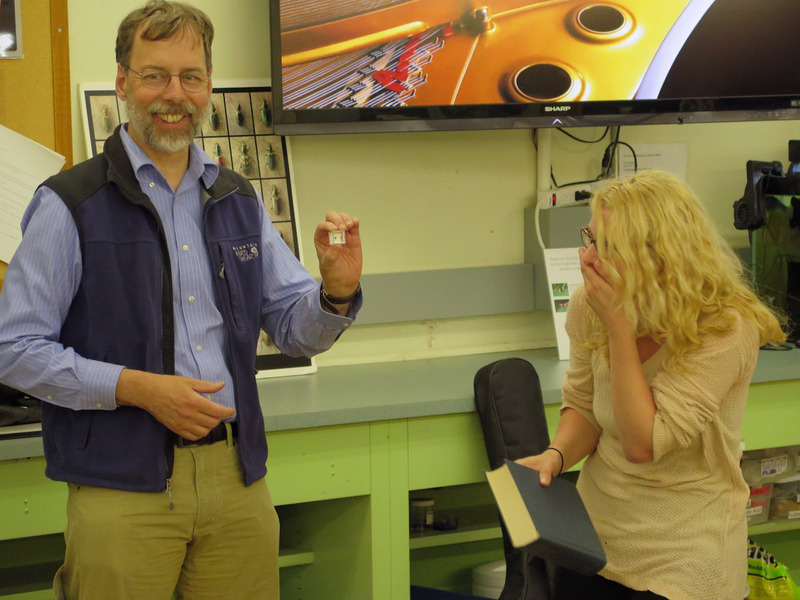 The most exciting was the confirmation that Shannon’s specimen was not in fact B. canadianum, but was instead an undescribed species that I had never seen before. (I say “confirmation” as after my earlier blog, I did a genitalic dissection, and realized right away that it wasn’t B. canadianum.) 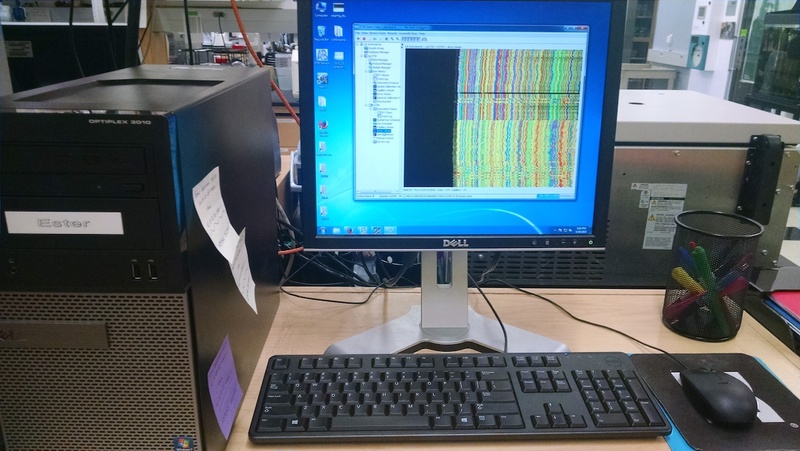 We also got for the first time a lot of data from the gene MSP, and that contained a lot of interesting information. We learned a huge amount about Trepanedoris in this class. Thursday, 4 June: This was the last class. We were all sad to have it end. At the start of the class, we took out large printed versions of the latest gene trees (which now contain about 220 specimens in them) and taped them up for everyone to look at. The class had to make their final decisions about the species boundaries based upon the gene trees, geographic data, and morphological data. They talked about it as a group – and came up with a very reasonable proposal. As a bonus, we had Nanaimo bars to eat. 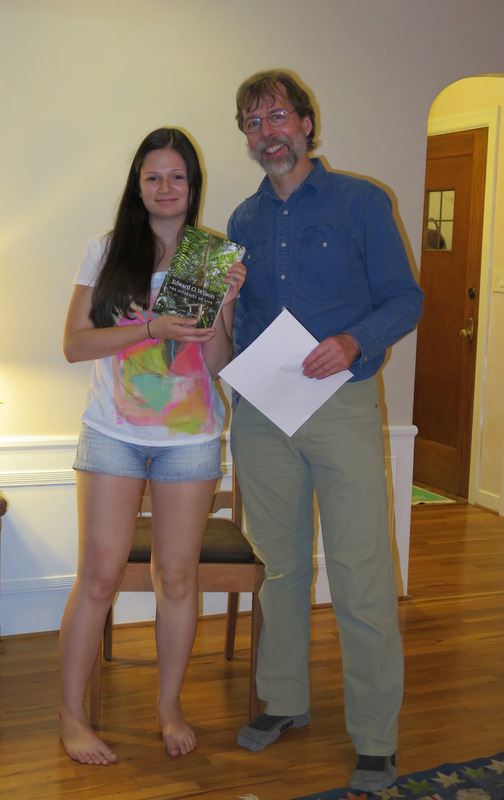 Saturday, 6 June: We had the class party this day, including awards to each member of the class. More about these in another post! Thursday, 10 June: We got together this day so that we could share projects with each other. The projects were magnificent. More about these in another post! 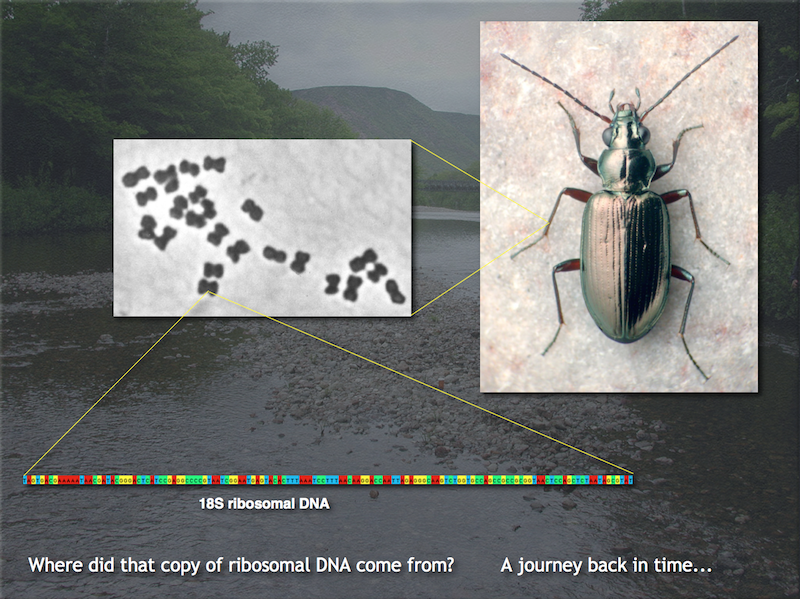 In an earlier post, I outlined the steps we took to extract and amplify DNA from the beetles we collected in the Discovering Insect Species field trip to Klamath Marsh. 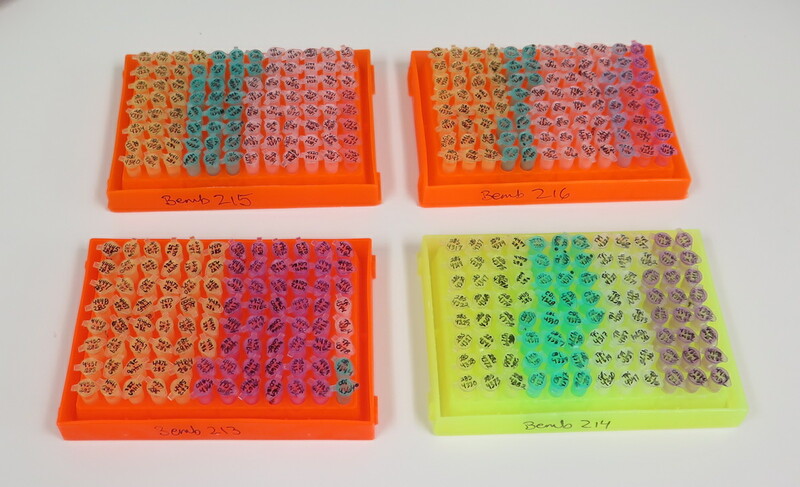 As mentioned, the students extracted DNA from 36 beetles, and amplified two genes for each. 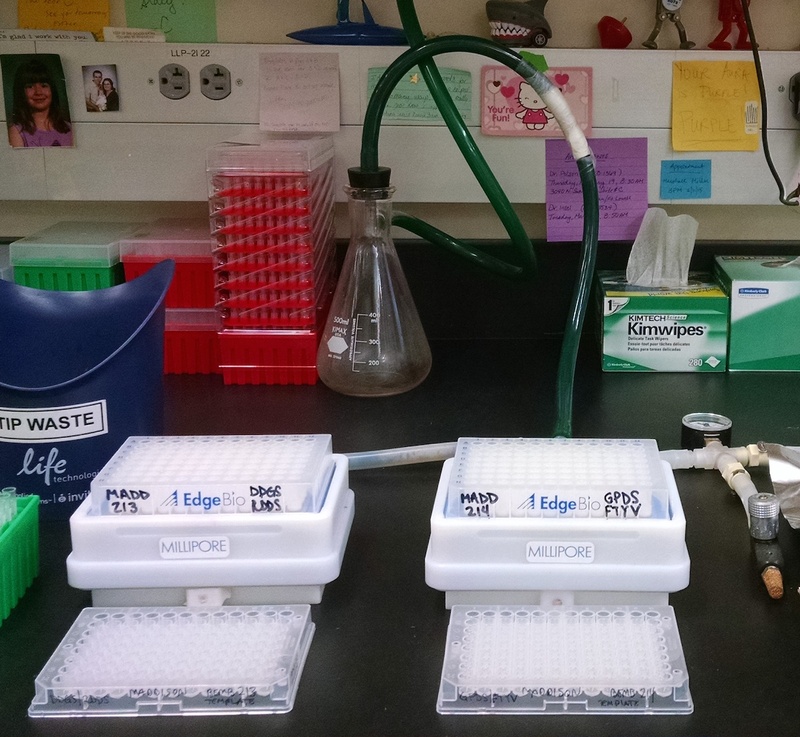 Mamo and Danielle came in and amplified some additional Trepanedoris for 28S, and also amplified the MSP gene (Muscle-Specific Protein 300) from 22 Trepanedoris specimens, as part of an exploratory study. We have never looked at MSP before in Trepanedoris, so we are most curious as to what the data will reveal. 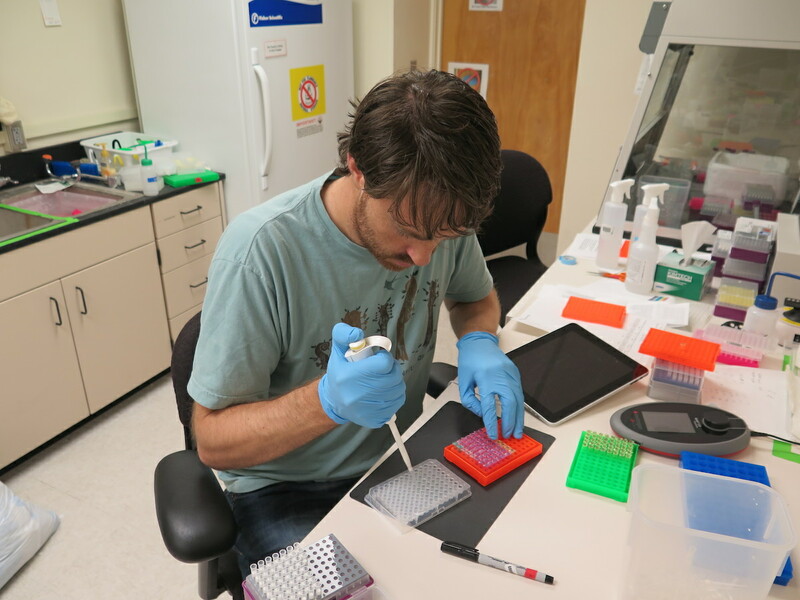 Our next step was to get those PCR products sequenced. However, before I write about that, some background. John wrapped up that trio, and put it onto dry ice in a cooler. 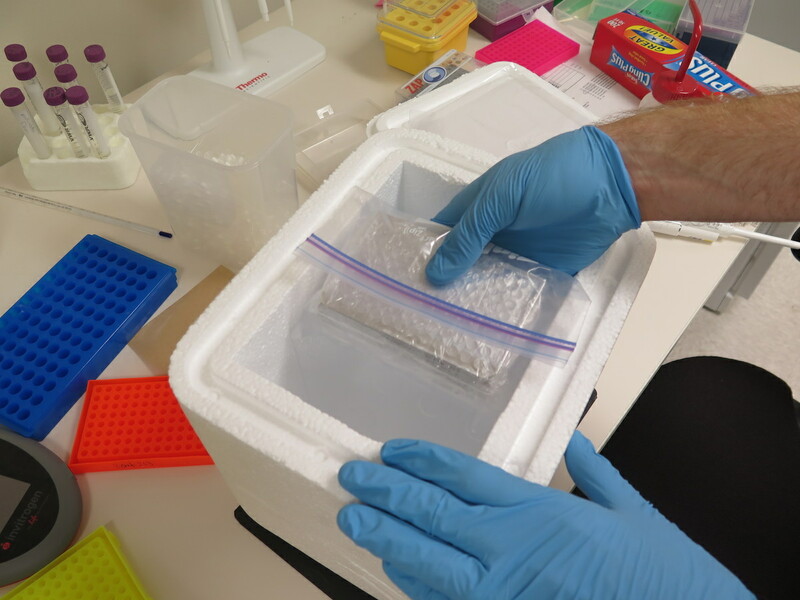 He did the same for the other three plates, put the cooler into a box, wrapped everything up, and off it went to be FedExed to the University of Arizona, were we get our PCR products sequenced. These went off on Monday. 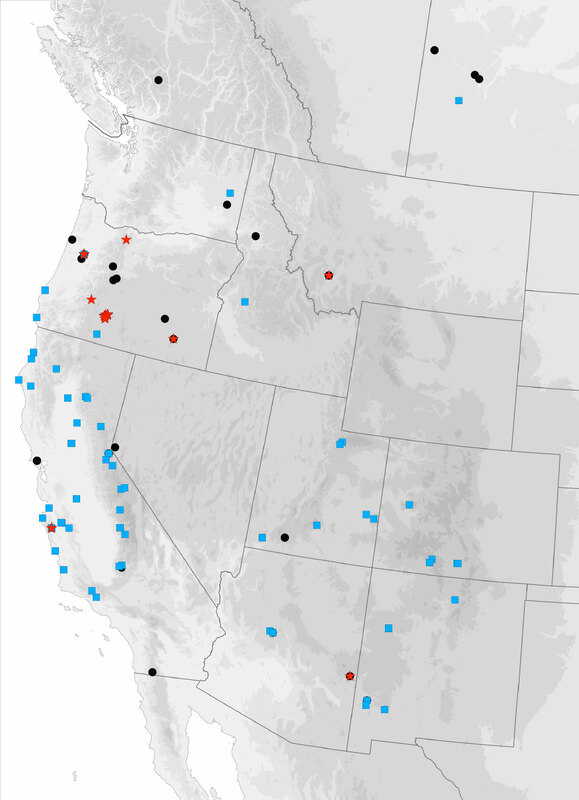 I am absurdly excited to see what these 300+ sequences reveal about Trepanedoris diversity. Apparently we will get the data back on Friday, but I will hold off on downloading them until class next Tuesday, so that all of the students can be there as we see the results for the first time. I’ll report back as progress happens! 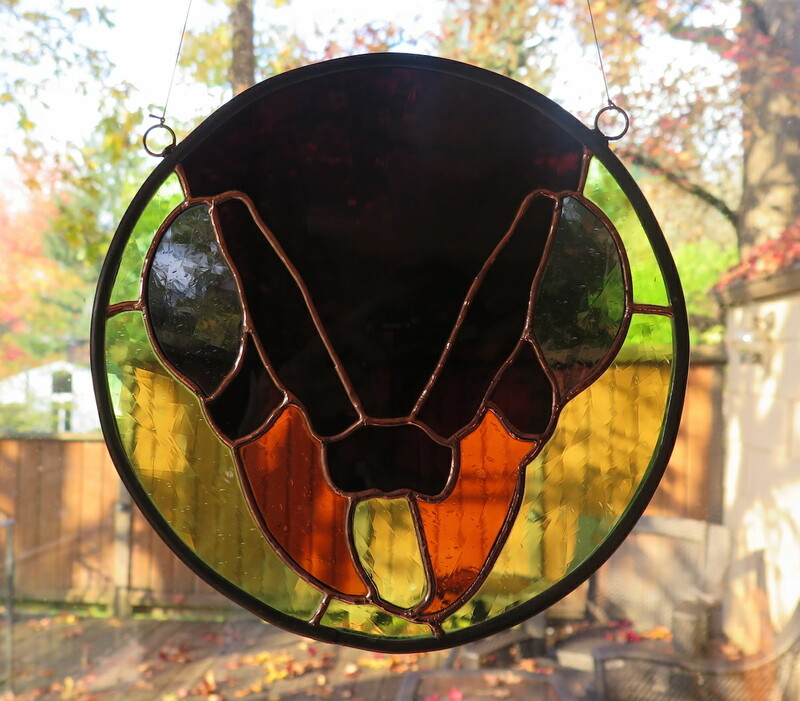 Shannon, a student in the Discovering Insect Species course, went down to Eugene last weekend and looked for Trepanedoris. To say that she did well would be an understatement. She caught all four species that I had seen from the Willamette Valley of Oregon (Bembidion acutifrons, B. elizabethae, B. fortestriatum, and B. siticum), and more. At first glance I thought it was an undescribed species, but after looking at it more closely I now think that it is an extremely small specimen of Bembidion canadianum. I have only ever seen one specimen of Bembidion canadianum from Oregon, collected in 1955 from east of the Cascades, around Upper Klamath Lake. 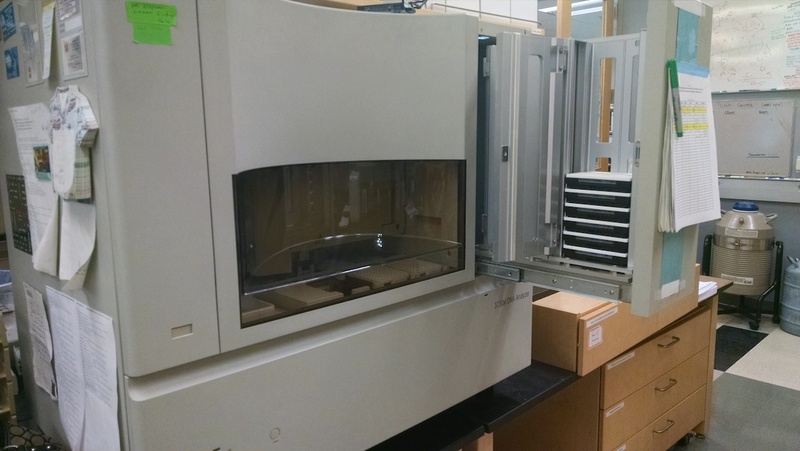 The specimen is housed in the OSAC. I’ve seen many nematode-filled Bembidion over the years, but this one was unusual, in that it had nematodes of different sizes: a few big ones, and many small ones. Normally all the nematodes are of more or less the same size. 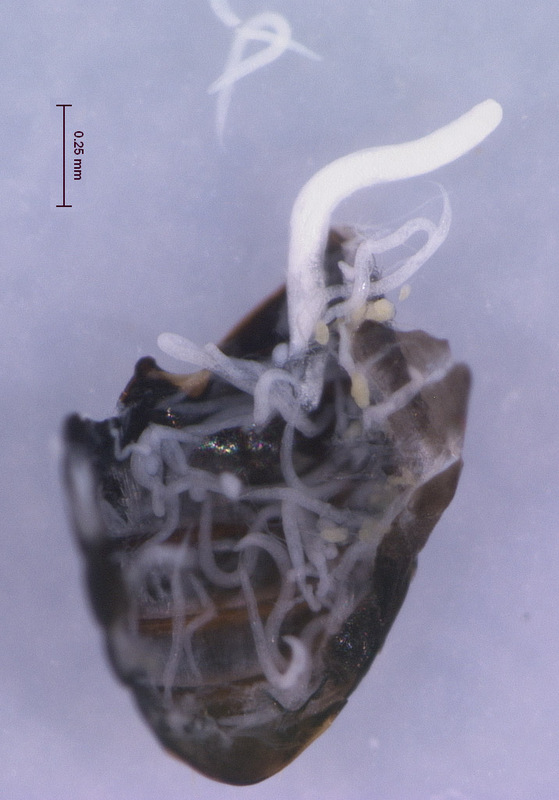 Another thing that is unusual about this beetle is that it still had what appeared to be fairly healthy testes and accessory glands; a nematode-filled Bembidion normally has very little of its own tissue remaining. 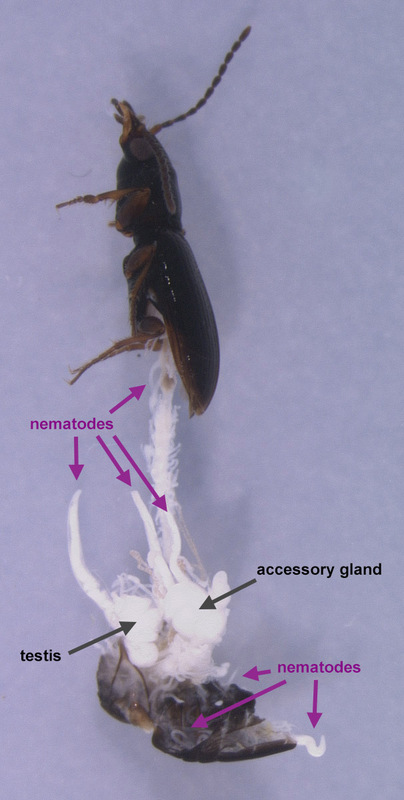 Although interesting, the nematodes will cause some problems in extracting beetle DNA from the specimen – as it will be hard to avoid extracting nematode DNA instead!